Looking for something fun to do on a weekday when you are too sunburned to go back to the beach? Try a walking food tour! Check out the one we took the kids on over our Spring Break! 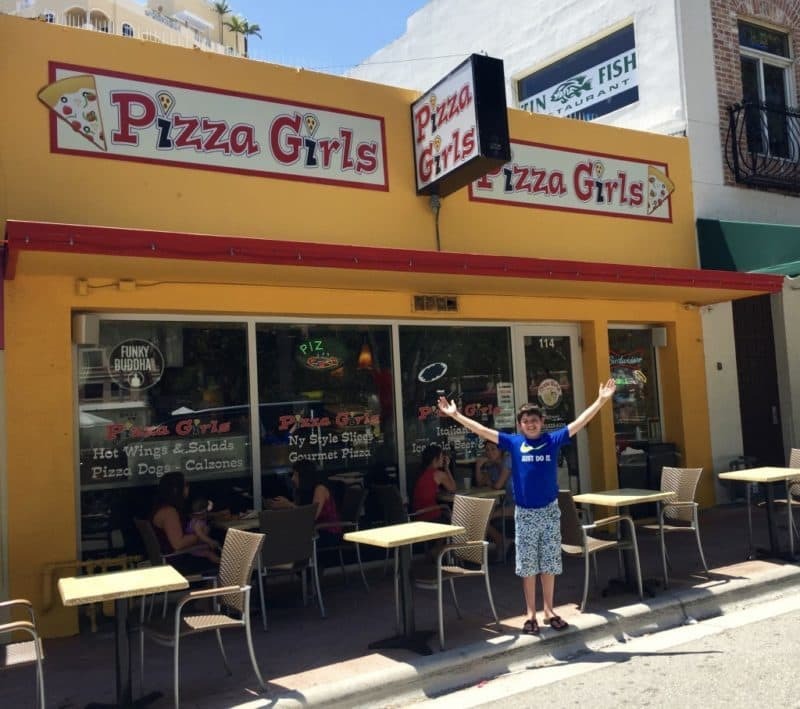 While on Spring Break in Palm Beach this year, we were looking for activities that the kids could do with us. 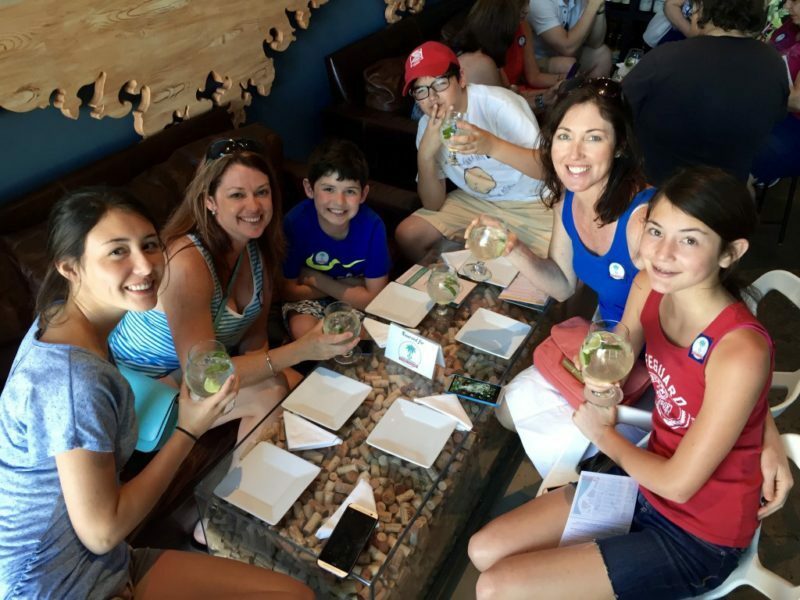 We were traveling with another couple and their girls (all of whom are adventurous eaters-one ordered escargot for dinner one night) and when the hubbies went to play golf, we decided to take the kids on a walking food tour. Lunchtime, walking, eating… Sounds like a good way to fill their bellies and wear them out! 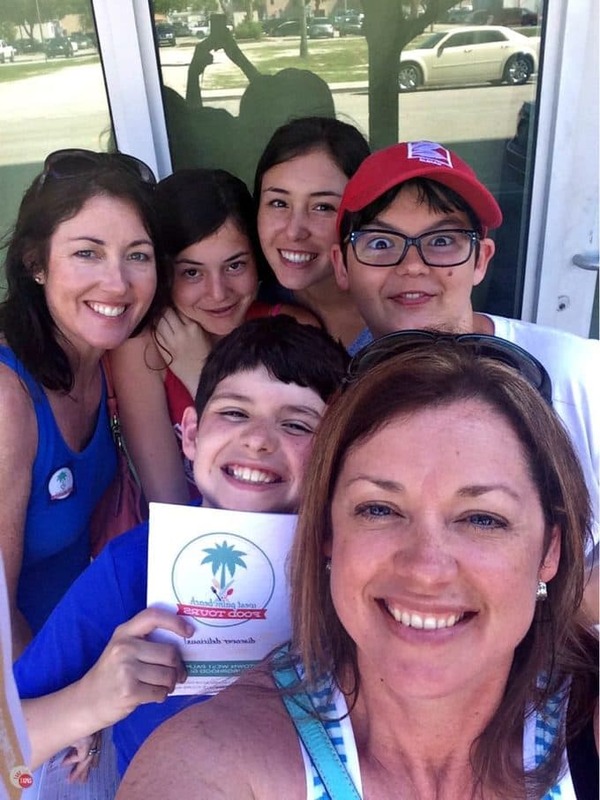 Enter the West Palm Beach Food Tour! Beware, lots of photos… I will say that I brought my camera, but forgot the camera card, so I took all my photos with my phone. That is the second time I went on vacation and couldn’t use my camera. When will I learn? Here we are all ready to go. My sons pledged to try everything they were served so I was happy to pay for the tour! 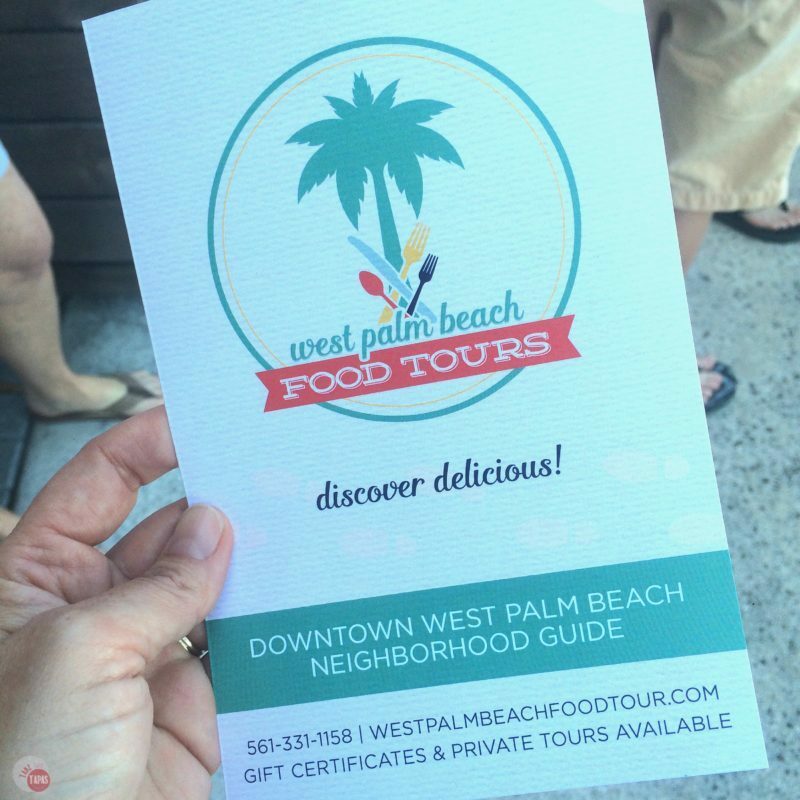 The West Palm Beach Food Tour stops at 6 restaurants, food tastings at each location. The total walk is just over 1 mile and at a nice leisurely pace. In between the stops, Kristl, our tour guide, gave us a brief history of West Palm Beach. Educational and tasty! Let’s hurry up and get started! The first place we stopped (or the restaurant where we started the tour) was The Blind Monk. I was totally in love with this location. They served small plates! Taking its name from blind grape tastings during the wine making process, they really deliver! Live music, poetry, great food, tables full of wine corks, and an amazing wallcovering that I want to steal! 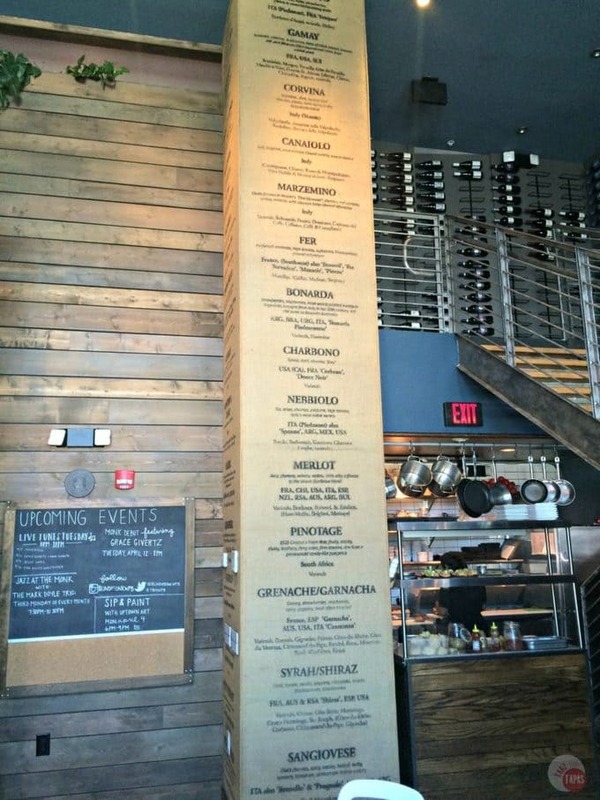 I loved the wine descriptions on burlap-like wall coverings. The food was equally intriguing! Ahi Tuna Tostada, Pan Con Tomate, and a mojito-like sparkler! 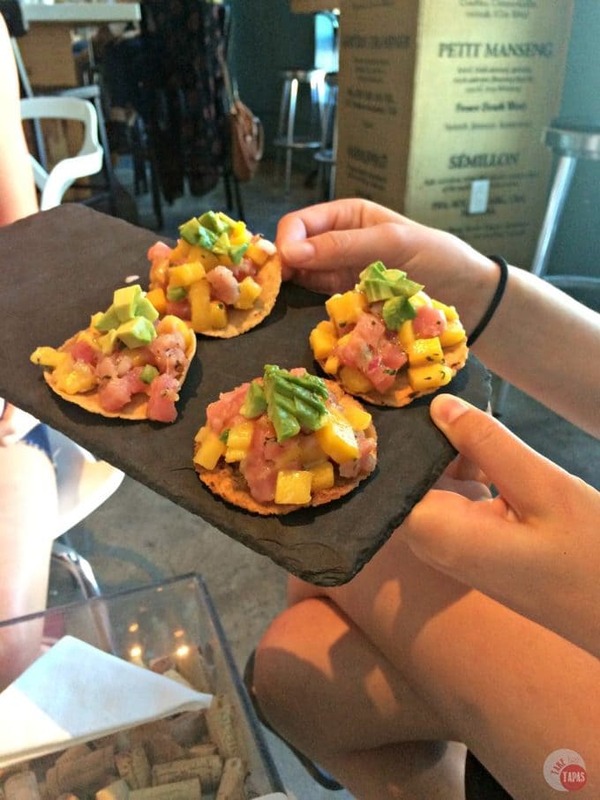 The tuna was so fresh, combined with a tart mango salsa, and served on a house made tostada chip. The perfect two bites to start. 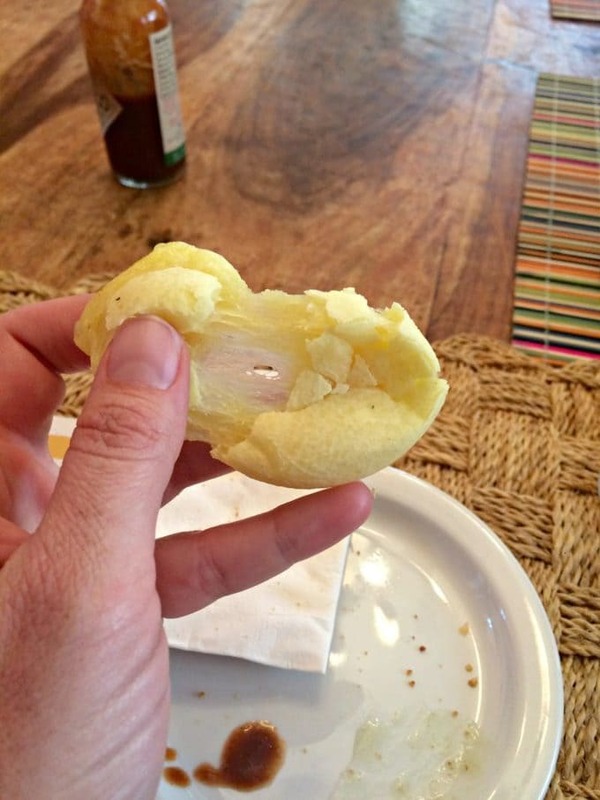 Connor (my youngest) tried one bite and I got the rest. Braxton ate all of his. Good start! The Pan Con Tomate was equally as good. 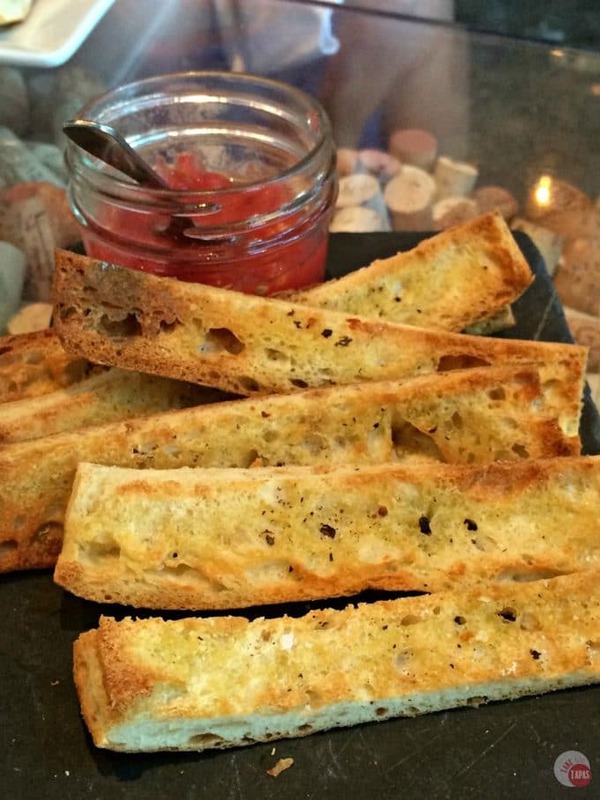 Garlic rubbed toast served with fresh, tomatoes. The simplest ingredients always make the best food. Simple but elegant! We tore that plate up!!! The adults washed theirs down with our “mojito” made with Prosecco, the kids had a version made with sparkling water. They were just as happy! The tour lasts 3 hours, 11am-2pm, so you get about 30 minutes at each location. Saddened to leave The Blind Monk as I could have stayed there all day, off to the next spot! 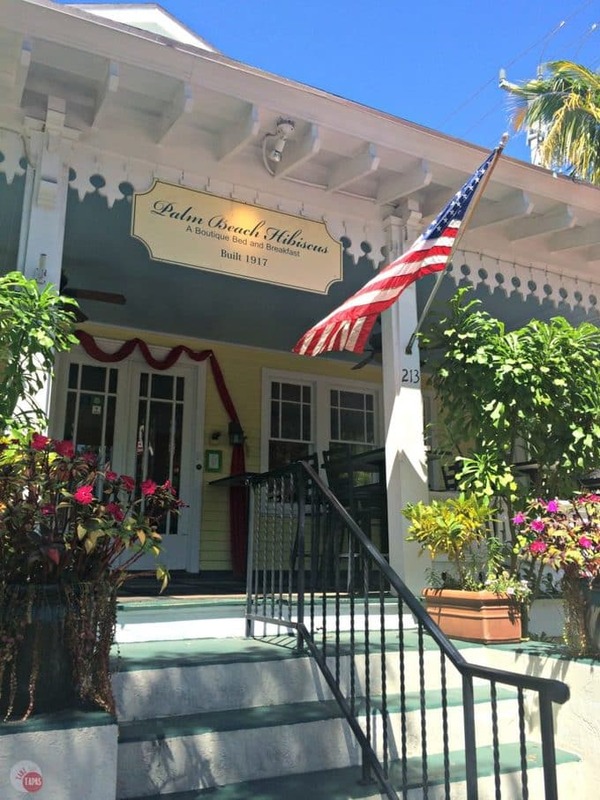 One of the oldest homes to still have this architecture (shotgun house and arched walls), it is now a bed and breakfast with a great patio open at night. 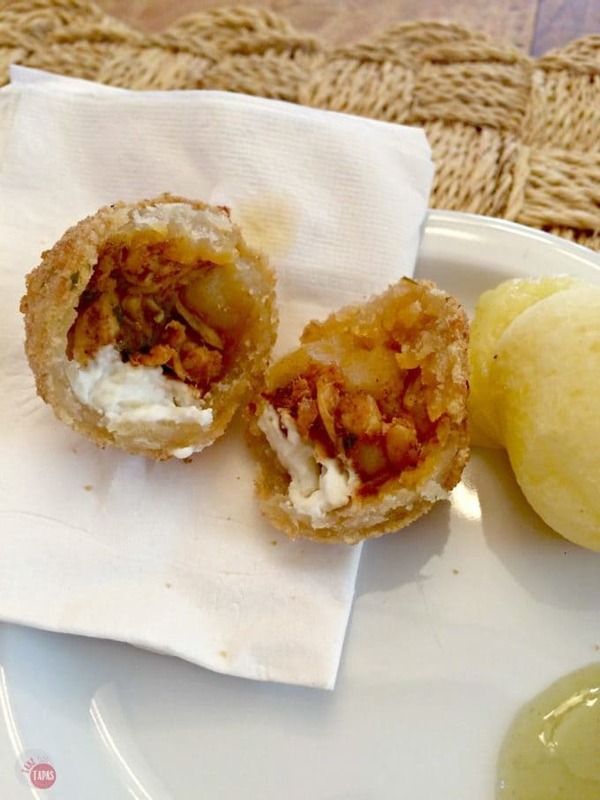 The locals gather there and listen to live music and snack on delicious treats like Brazilian Coxinha (chicken, cheese, pastry) and Pao de Queijo (Brazilian cheese bread). Both of these I need to learn how to make. 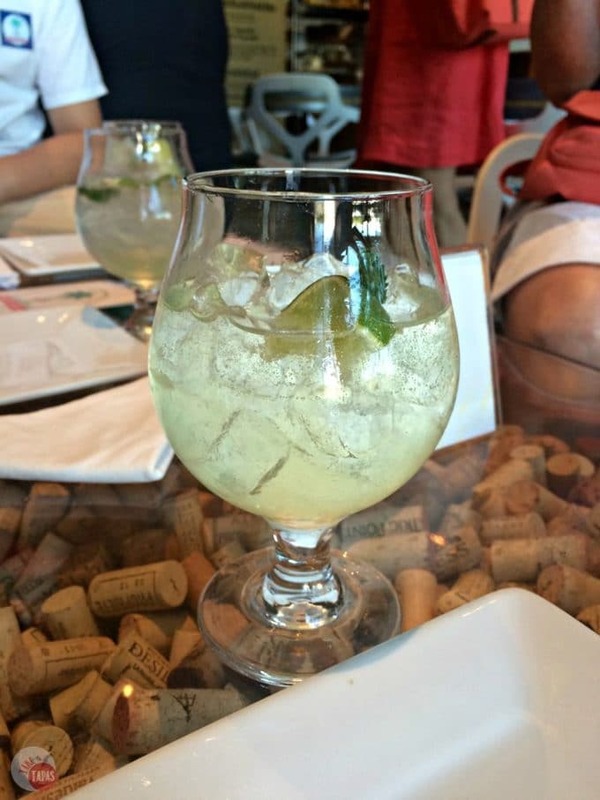 So I looked at my Brazilain Blog Buddy Olivia’s Blog, Olivia’s Cuisine. She makes them too! Check out her Coxhina recipe here! These were beautifully layered with spicy chicken, potatoes, and goat cheese! After a stroll through the back patio, we headed over to Hullabaloo. Down in a section, off the main shopping area called the “locals block” because this is where all the locals hang out, is a funky joint with a large menu, a great chef, and a tiny kitchen!! I didn’t get a picture of it, but I did get a picture of the outside patio. 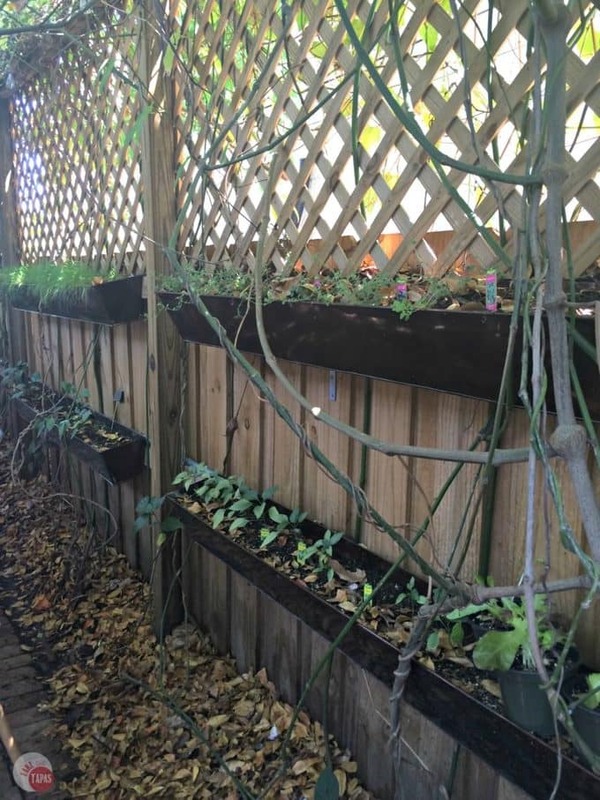 Not only can you hang out in the patio eating and sipping cocktails, there is a refurbished airstream camper to dine it, you can browse over to the herb garden on the fence where they grow all their own herbs for the restaurant! 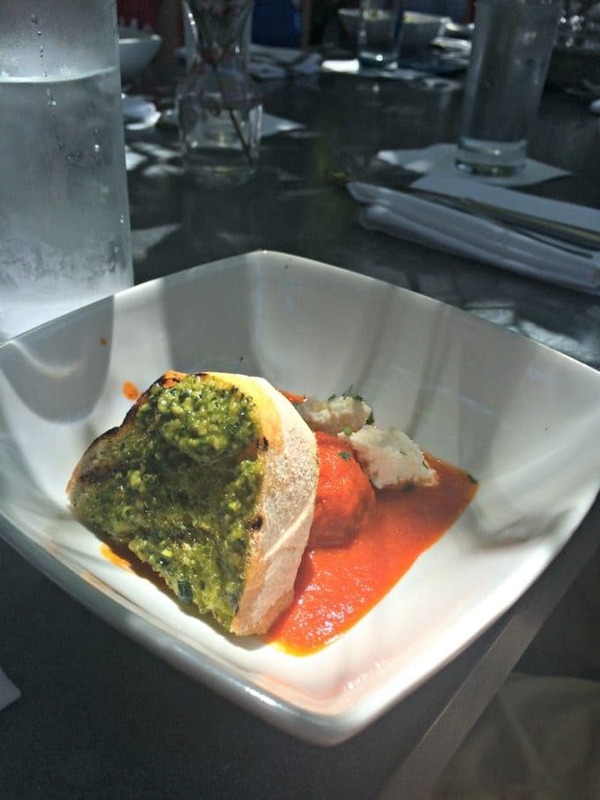 The chef at Hullabaloo, Fritz Cassel, is a local celebrity, made us a chicken meatball with ricotta and pesto bread. They utilize every part of the chicken so there was plenty of moist dark meat in it. Served with a simple house-made tomato sauce, house-made ricotta, and a pesto cheese bread where the pesto is made from the herb garden shown above! It was amazing!!! I was happy Connor didn’t eat his meatball because I got to eat two:) The ricotta was so creamy and you could taste how fresh is it was. One of their other specialties is the Brussels sprouts. Tossed with candied pine nuts and finished with a bacon aioli! I was sad that we didn’t get to try that one, but on my next visit I will post pics of those! The next stop was Ganache Bakery. 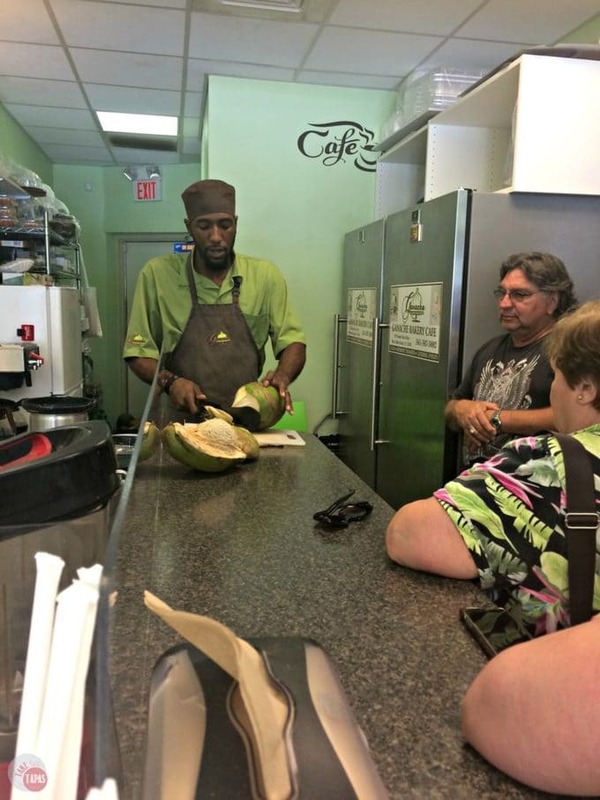 Owned by Jamal and Joan from the Caribbean, we learned about coconuts and how to tell how mature they were by shaking them. The more water you heard sloshing about the more mature they were. He opened one for us with a machete, that certainly got Connor’s attention, and showed us the sweet meat inside. We all got a small shot of fresh coconut water. It is nature’s sports drink because it is full of electrolytes and helps to keep you extra hydrated. Next, we tried a shot of tamarind juice that was freshly made in the bakery. A bit sour but also very refreshing. Once our palates were cleared, they sweetened them up with Key Lime Tarts. Key Lime Pie is the official dessert of Florida and these tiny tarts were two bites worth of sweet and sour. Flaky pastry crust filled with tart custard and topped with creamy whipped topping seemed like the best way to end the trip to this amazing bakery. I also bought a few cupcakes, some macarons, and a cannoli! This is a picture of Jamal and his machete! By the way, I ate my Key Lime Tart before I had the chance to take a picture of it. Sorry, not sorry! 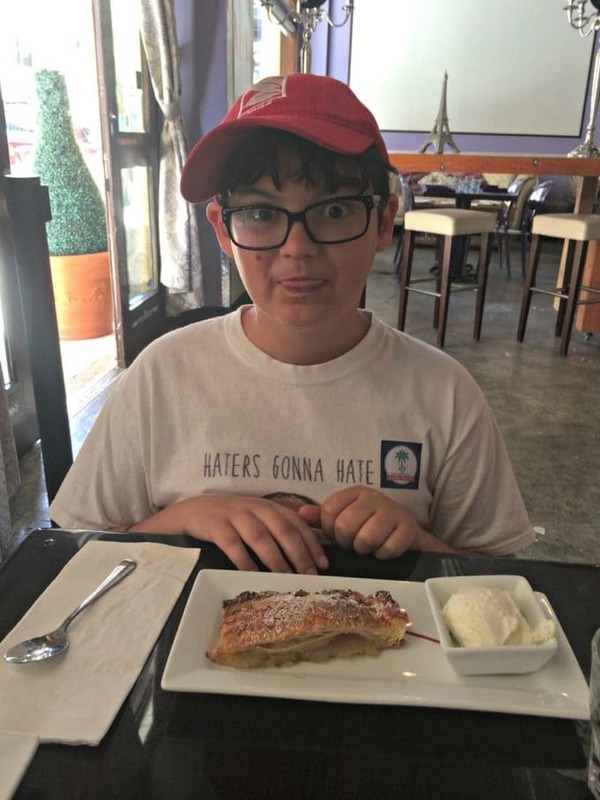 You can go to the West Palm Beach Food Tour Website and check out all the pictures of the food, and all the photos from the individual tours. Ours was on April 8th if you feel like scrolling to see all of them. At the beginning of te tour, Kristl asked us to introduce ourselves and say what our favorite food is as a way to get to know the other tour members. Connor said that pizza was his favorite food so he was excited to see that stop number 5 was a pizza joint. Across the street from the French restaurant Pistache where we ate dinner the night before, Pizza Girls hit the spot. 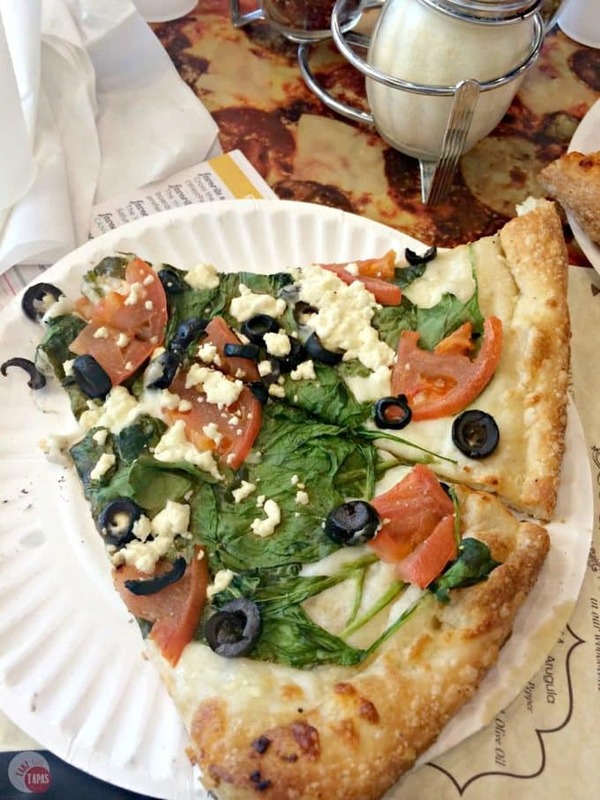 You can buy pizza by the slice, albeit HUGE slices, salads, and pizza rolls! 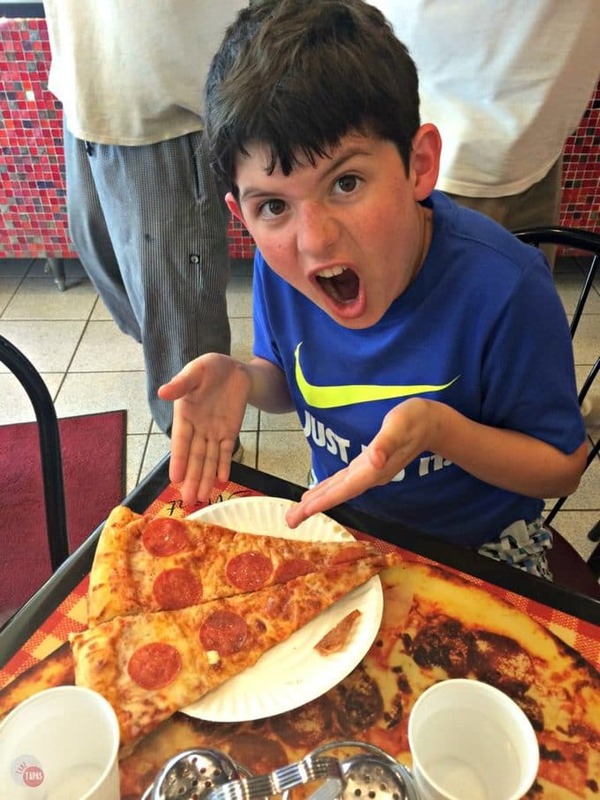 This is Connor and his one slice. They cut it in half in case you want to share with someone. He didn’t. Connor and Braxton went for classic pepperoni, I went for the Greek. Jen and Phoebe run the place (not it is not a Friends episode) and have been the pizza joint for celebrities to swing through too. On their wall of fame, you can see pictures of presidents and musicians. Connor ate all of his. Guess so because he didn’t eat anything else that day. I. on the other hand, only ate half of a half because I was eating all of his portions too:( Thank God for Spandex. After a stroll on the waterfront, gazing at mansions and boats that can hold a small town, we headed toward our final destination. Le Rendez-Vous. A trendy, Parisian restaurant, that showcases food as well as art. The art is for sale, highlighting local artists, and is definitely a conversation starter if you are getting a food coma. We were served a Croustade aux Pommes a la Mode (Apple Croustade with Ice Cream), that was plated beautifully! Sprinkled with pink peppercorns, the ice cream perfectly complimented the flaky apple pastry. Here is Braxton, wearing his potato shirt for the food tour, about to dive it. The portion was way too big for my already full tummy, but I powered through! 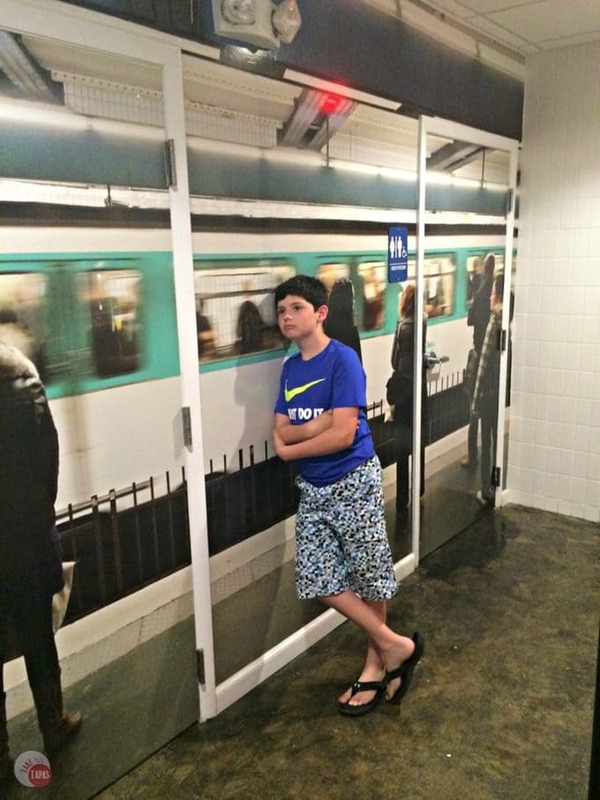 Here is Connor waiting for the restroom in what looks like a Subway platform. I was in no way compensated for this post. I paid for my tour tickets and I ate all my food. I just wanted to share my experience. Food tours are my new favorite thing to do on vacation!! It was also a great way for the kids to experience new foods, new cultures, learn some history, and get some fresh air and exercise! 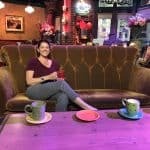 If you are planning on going on vacation, check out the area and see if they have a food tour. *tour tastings subject to change so you might not get the same foods that we did.